VANCOUVER, June 14, 2018 /CNW/ - Eagle Spirit Energy Holdings Ltd. and Canada's Four Pipeline Craft unions are pleased to announce the signing of a Memorandum of Agreement (MOA) to collaboratively pursue and deliver the Eagle Spirit Energy Corridor Project (the Project) from Fort McMurray, Alberta to Grassy Point, British Columbia (B.C.). The MOA is focused on working in partnership between indigenous communities and Canada's unions for a mutually beneficial project agreement that will result in meaningful economic development and long term community benefits. The MOA ensures significant indigenous ownership and participation and best-in-class skilled labour with an emphasis on the local workforce. The MOA commits signatories to a comprehensive safety and training strategy with long-term benefits to participating communities, and the inclusion of local residents, businesses and First Nations throughout the construction process. Canada's Four Craft Unions represent over 330,000 members from the International Union of Operating Engineers (IUOE), the Labourer's International Union of North America (LiUNA), the United Association Canada (Canadian Piping Trades) and Teamsters Canada. The MOA covers the construction of the Project which includes all pipeline construction and pumping stations in B.C. and Alberta. "Our project is a nation-building milestone for the natural resources industry and will be a precedent setting example of how to do good business with First Nations, and an important step towards reconcilliation. It will also be the greenest, safest energy corridor ever built, and the first indigenous-led major infrastructure energy project in Canadian history. We will provide indigenous communities with own source revenues and training, producers with access to international markets, workers with valuable high-paying jobs, and governments with valuable tax revenues. It is a project that we hope unites the provinces of western Canada and we are proud to be doing this with our hard working union sisters and brothers." 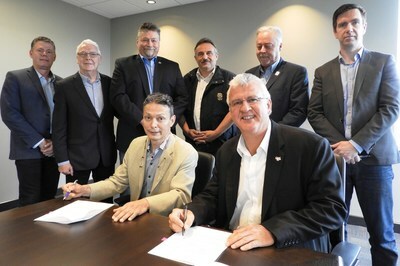 – Calvin Helin, Eagle Spirit Energy Holdings Ltd.
"We are very pleased to be working closely with indigenous leaders towards the delivery of a best-in-class project with a deep commitment to safety, training, and opportunity for local residents, businesses, and indigenous communities. "- Brian Cochrane, on behalf of Local 115, International Union of Operating Engineers, Labourer's International Union of North America, United Association Canada (Canadian Piping Trades), and Teamsters Canada. The International Union of Operating Engineers, Labourer's International Union of North America, United Association Canada and Teamsters Canada represent 330,000 unionized workers across Canada in the pipeline trades. Eagle Spirit Energy Holdings Ltd. is a First Nations-led company with a plan for a green energy corridor from Fort McMurray Alberta to tide water at Grassy Point in northern British Columbia. The project represents over five years of preparatory work and is led by over 35 First Nations through their Chiefs Council with Calvin Helin as Chairman and President.